In addition to tracking your consumable inventory items, you can also use InventoryEdge to track tools that you keep in stock. This equipment can be checked in and out of the system similar to a library book. 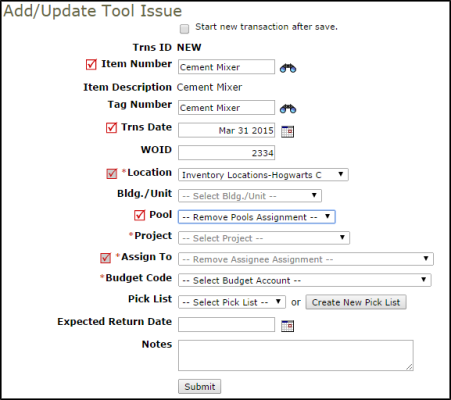 There are two types of Tool transactions in InventoryEdge, Tool Issues and Tool Returns. Click on the Tools link in the Transactions section of the home page. From the My Tool Transactions list, click on the + Add New Tool Issue link on the right side of the list. Type the Item Number into the field or click on the binoculars icon to open a pop-up window where you can search for and select the tool. If a Tag Number was entered for this tool, it will automatically populate in the field. The Transaction Date will automatically populate with today's date. If you are issuing this tool for use on a work order, enter the WOID. This will populate the Location, Bldg./Unit, Project, Assign To and Budget Code fields automatically with the information from the work order. A Tool Issue transaction will also be recorded in the Transaction section of the work order. If you are not issuing this tool to a work order, you will need to select either a Location or Assign To user before saving the transaction. One of these two fields is required and will help you track where or who the tool is loaned to. Select the Pool that the tool is being removed from. You can assign this tool issue to a Pick List if needed. Enter the Expected Return Date. Click Submit to save the transaction. In the Tool Shortcuts section at the top of the page, click on Tool Return. *Note: We recommend that you use the shortcut link rather than the New Tool Return link to the right of the list, because the tool information will automatically populate into the form for you. Click the Return button next to the tool you are returning. The Tool Return form will already be filled in with the appropriate information from the Issue form. Double check to make sure the information listed is correct and click Submit to save the return. If this tool was issued to a work order, a Tool Return transaction will be recorded in the Transaction section of the work order.